For many who attended the July 18th counter-protest in Melbourne, on a weekend of nation-wide Reclaim Australia rallies, the experience was instructive on the nature of police and policing. Many of us came to the protests with some awareness of police brutality and some experience participating in protests that attract large (and to varying degrees hostile) police presence. Nevertheless, many were shocked and some traumatised by the level of violence and aggression shown by police towards our side of the lines. 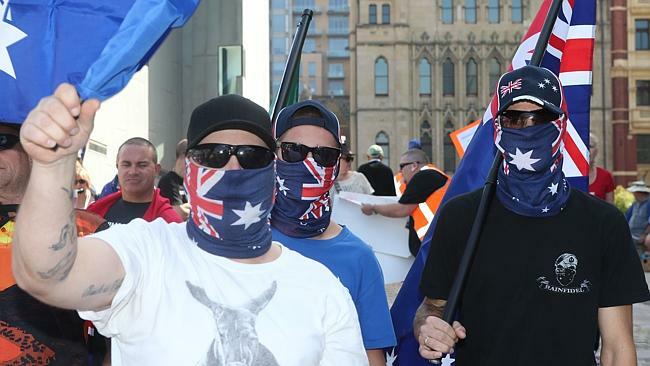 This was especially jarring when contrasted with the extremely cooperative (and at times openly fraternal) nature of the policing of Reclaim Australia and the United Patriot’s Front, whose rally was facilitated and protected by police actions. There are two things to remark on about this police violence. Firstly, we have to recognise the privilege that accompanies the ability to feel shocked by this behaviour. For myself, a middle-class gender-conforming white woman, the first time in my life that I felt a real fear of the police was on the 4th of April at Reclaim Australia’s first Melbourne rally at Federation Square; when the mounted police charged our lines, knocking one of our number unconscious in the crush. The fear I felt was immediate and visceral, and was also accompanied by a disorienting feeling of confusion; almost of betrayal. Ringing in my ears was the question: but aren’t they supposed to be here to protect me? Last Saturday I was mentally prepared for that fear and so it didn’t weigh on me as heavily but it is still worth pointing out that, even if the police force’s purported duty to protect the citizenry is an illusion, it is an illusion afforded only to certain people. To be able to be shocked, at the age of 28, at the possibility of police brutality is a luxury and a mark of the privileges of class, race, gender conformity and employment that allow certain people the right to feel safe. This is not, however, to say that there is no place for this feeling of shock. When understood properly it is still a strong basis for a re-negotiation of our understanding of policing and therefore of the state. For those of us who are able to be safe from police violence – insofar as our actions conform to the demands of the state – we can reflect on what kind of obedience the state demands from us as a condition of our safety and what kinds of values are protected by that obedience. This Age article, for example, quotes Assistant Commissioner Stephen Leane who says: “From a policing point of view, we can’t see the difference between the two sides.” There are two points to make about this comment. Firstly, it is quite simply untrue, in terms of the disparity of police behaviour towards the two sides on the day. Secondly – even if it were true – it makes quite clear exactly what kinds of values are contained in a “policing point of view”. From “a policing point of view” no difference can be discerned between a peaceful, diverse crowd of men and women of all ages, some of whom have scarves on their faces (these are the “hooded and masked anarchists”) and a cohort of large, aggressive white men marching through the city wearing nationalist paraphernalia up to and including swastikas. Quite obviously, then, what a “policing point of view” does not include is any concern for the right of people of colour to feel safe in public space. “Uphold the right,” indeed. Much comment has (rightly) been made on the handshake between a police sergeant and a Reclaim Australia protestor, captured by a photographer and shared widely on social media. It seems important to me to notice that the gesture is not a ‘high-five,’ as has been frequently reported in media around the event, but rather a hand-clasp, a much more intimate and implicating gesture of solidarity. A high-five would still have been very disturbing but could more easily be read as flippant or playful – this, however, is a joining of hands, a linking, an expression of trust and of white male fraternity. Speculation around the meaning of the interaction in such circumstances is both unfair and unfounded. The “split second” nature of the action and the “dynamic environment” in which it took place are here read as defenses which render the hand-clasp immune to criticism or even speculation. Many have pointed out on social media that many actions punishable by police attentions are also of a split second nature and occur in dynamic environments. Furthermore it can be argued that the overwhelming majority of policing decisions are made quickly and under dynamic circumstances – so the context is hardly exceptional. However it ought to also be pointed out that our split-second decisions are in fact most revelatory of our biases, values and affinities. It is precisely the split second nature of the action that renders it revelatory of an instinctive feeling of affinity between police and far-right protestors. For similar reasons, the approach by some to attempt to discover the particular individual’s name seems somewhat misguided: the incident is surely important in what it reveals on a larger scale about the police force as a whole rather than as an individual person acting in an isolated incident of split second duration. McKenzie-Murray’s article forms one of a series of concerned pontificating by white men quoting other white men who are discomforted by the ‘divisiveness’ of anti-Reclaim actions and who rehearse various iterations of the ‘oxygen’ trope: arguing that by seeking to disrupt white supremacist demonstrations, anti-Reclaim protestors provide airspace and interest to a brand of racism that would otherwise remain uncontrovertibly fringe. These accounts also share a desire to position anti-Reclaim protestors as Reclaim Australia’s equivalent, a kind of opposing mirror-image. Writing in response to Welcome to Australia’s Brad Chilcott’s analysis of April’s rallies and counter-protests, commentator Wenny describes this false positioning of polarities crisply: “I hate the views of racists and fascists and am scared of them; racists and fascists hate the colour of my skin and seek to dominate and harm me.” According to the Chilcotts and McKenzie-Murrays of this world, Wenny’s fear of racist violence is equal and oppositional to racist fears of invasion; antifa contempt for the antics of fascist thugs like Blair Cottrell is equal and oppositional to white nationalism’s contempt for migrant claims to basic rights of citizenship; and the symbolic ‘violence’ of flag-burning is equal and oppositional to the symbolic enactment of violent white supremacy of flag paraphernalia (including those increasingly unsettling face masks). As Wenny’s article explains, the function of this account of equal-but-opposing forces is to allow the positioning of the (white nationalist) “progressive” as the reasonable middle: thoughtfully deliberating between the “unedifying anger” of the “outer fringes”. Chilcott positions himself as a ‘reasonable’ voice for (white nationalist) ‘middle’ Australia… The insinuation… is that the ‘progressive’ but ‘rational’ management of Australia lies with white-skinned nationalist citizens who have the authority and ability to govern social relations between white supremacists and minorities. Look, I think your audience is not the racists you’re shouting at, but the people at home. These anti-Reclaim protesters say their intention is to disrupt the rally and they achieved it… But those watching at home, they couldn’t tell the good guys from the bad. The real audience, in both Chilcott and Leane’s account, are “those watching at home” – middle Australians who are neither anti-Islamic nor anti-racist (another odd juxtaposition often suggested); those who do not participate in either white supremacist rallies nor in their disruption but who respond to both in Leane’s ‘twitter feeds’ and ‘Facebooks’. Police forces thus police not only the streets and the acceptable boundaries of resistance but also the very borders of the polity itself. The real audience are those ‘at home’ who receive and interpret ‘the message’: the comfortable reasonable middle of Australia that is always and unperturbably white, and which has – Wenny’s insight bears repetition – “the authority and ability to govern social relations between white supremacists and minorities”. Perhaps we might take police violence as precisely the means by which we give lie to these discourses of equivalence. Both sides were not the same: both sides were not treated in the same way. One group engaged in a staged enactment of disobedience that can be clearly seen to form a part of a pattern of radicalisation of white supremacist ideology in Australian politics. The other, seeking to disrupt that performance, enacted true civil disobedience. By challenging this false equivalence we can disrupt the account of the ‘reasonable middle’ which is premised upon it. Only one side offered a real challenge to this violently colonial white nation state. The other threatens only a recognition of its proximity.